A sound organization must check its safety practices very carefully. The debits of possible loss or injury situations should balance against the credits of adequate safeguards. 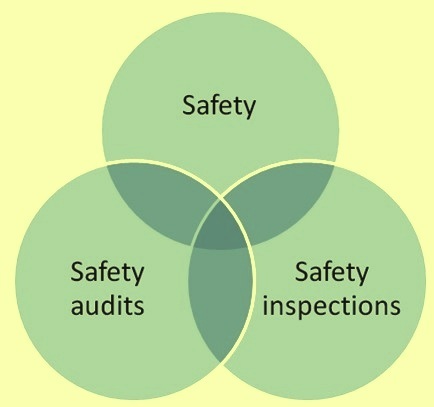 Safety audits and safety inspections are the tools which an organization use for its preparedness towards safety (Fig 1). Safety audit involves systematically going through the workplace to evaluate safety programs and practices within the organization while safety inspection involves systematically going through the workplace to look for safety hazards or lapses in safety practices. Both are important components of a workplace safety plan. They are frequently used interchangeably though they are not the same. A safety audit is a structured evaluation of the application and efficiency of the safety policy, safety programs, and safety systems of the organization. It is also a control of the compliance with the regulatory regulations and a clear standard, which may be a national standard or organizational internal standard. An audit is a widely used instrument and an important tool to improve safety. It is the process of verification that the safety programs are working. Broadly defined, an audit is a systematic review of operations and practices to ensure that relevant requirements are met. Safety audit apply many methodologies to mitigate safety risks within the organization. Safety audits evaluate all aspects of the safety programs with special emphasis on the quality as well as the quantity of safety activities at every level. Safety audits are a managerial or a corporate activity. Safety inspection, on the other hand, is defined as that monitoring function which is conducted in an organization to identify, locate and report existing and potential hazards that could cause accidents in the work place. Safety inspections frequently reveal potential causes of accidents and, thus, provide an opportunity to take corrective action before an injury occurs. Safety inspections are conducted at the line or operating levels and are an important part of the overall safety program. Safety inspections look at the physical conditions and work practices in a workplace. Equipments are examined to determine whether all safeguards are in place and whether its operation presents any hazards. Air, water, and other samples may be obtained to test for hazardous substances. Work practices are observed to identify unsafe actions. Safety inspections are effective ways of preventing accidents. However it is essential to take corrective action as soon as possible to abate all hazards found during a safety inspection. If the hazard presents an imminent danger to employees, the corrective action is to be taken immediately. For any reason, if the corrective actions are delayed for non imminent hazards, then it is necessary to document the reason for the delay and the estimated date of correction. When the corrective action has been completed, then the action date need to be documented. Safety audits are report cards on the success of safety programs, environmental programs, and process safety management. They are structured evaluations on performance and compliance. A safety audit is a structured, methodical assessment and evaluation of how work place activities affect safety. It reveals how the organization is performing in maintaining a safe environment. Its goal is to ensure a safe work place by striving to eliminate unsafe practices and hazards that lead to injuries and accidents. Safety audits can be conducted on different subjects related to safety. Main group of subjects related to safety audits are described below. Audit of safety management system – It is being used to monitor the systems used for safety within the organization by examining items such as the safety policy, safety procedures and other safety related documents. These audits are also used to monitor on site work in terms of adherence to the safety norms, safety records, site regulations and the statutory requirements. The results of these audits can either be responded to immediately or used to develop improvement plans, which can be monitored on a regular basis. Safety management system includes (i) organization, responsibilities and authorities, (ii) training, competence evaluation and instructions, (iii) action plans for improving the safety performance, (iv) carrying out of risk assessments, (v) accidents, near-misses, work related medical and ergonomic problems and rehabilitation results, and (vi) goals and results. Audit of management systems checks that (i) the existence of the system, (ii) understanding of the system by the employees, and (iii) extent of the application of the system in the organization. Audits of safe working procedures and employee behaviour – These audits focus on the observation of the employees at their work place to find out the violations of safety instructions, unsafe actions and unsafe conditions. The objectives of these audits are (i) avoidance of injuries and damages to the work men, equipment and material, (ii) promotion of a positive safety behaviour, (iii) increase in the awareness for safety, (iv) establishment of safety regulations, (v) checking whether safety instructions are understood and complied with, (vi) finding out the weaknesses in the safety management system, (vii) finding out and correcting unsafe actions and conditions, and (viii) motivation of the employees. Audit of safe working procedures – Safe working procedures are established for smooth working of the processes without any injuries to the equipment and employees . When auditing the safe working procedures the categories which are important include (i) personal protective equipment, (ii) posture and position of the work men, (iii) tools and materials, (iv) ergonomic considerations, (v) safety instructions, and (vi) order and cleanliness. Audit of a contractor activity – Auditing of safety practices followed by the contractors is a tool that is being increasingly used these days in the steel organizations. Other safety related audits – These include audits which focuses on specific topics such as (i) fire protection and means of escape, (ii) hazardous substances, handling, protection, and waste, (iii) electrical installations, (iv) temperature conditions, (v) noise and lighting (vi) working at heights, and (vii) housekeeping. Safety audits are usually carried out by looking into safety related documents consisting of policy, manuals, procedures, instructions and records of their implementation. This is also followed up by the visit of the auditors to the work place for verifying physically the implementation of these documents at the work place. Because of the wide variety of audits, and the various objectives that are being pursued during audit, it is necessary that the preparation and organization of audits are done in advance keeping in mind the requirements of the audit. Safety audits are normally carried out by the people who have training in safety as well as in auditing. One objective of safety audit is to look at the safety system with an independent eye. People from other departments with another background and competence observe normally those things which are different from the things usually observed by those who are familiar with the environment. There are organizations where the quality department is involved in the audits and the audit of the safety management system is combined with the audits of quality and environment management systems audits. Standardized documents for different subjects are used for the audits. Detailed checklists with many questions are available for the audit. A questionnaire is often sent out in advance to the department where the audit is to take place. Audits can be formally scheduled to a timetable. There is a variety of frequencies. Some organizations have defined targets/programmes for the number of audits that are to be carried out. Other safety related audits may be carried out without any warning as a spot check. The report of an audit is always be documented in some kind of audit protocol. Databases are often used to record, analyze and manage the auditing program, the results and the outstanding issues. Action plans with a time scale are agreed upon after each audit to ensure that the lessons from the audits are learnt and actions are taken for the removal of the non conformities. It is important that the action plan is owned by responsible employees. Follow-up audits are normally to be done by the line management. The outcome of the audit need to be discuss and followed up in regular safety meetings and other daily meetings. Corrective actions taken are required to be assessed in subsequent audits or other reviews of the management. Persons carrying out the audit vary depending on the nature of the audit. The audit team also varies in size but normally kept as small as possible. Training in auditing techniques is essential for the auditors. Effective safety inspections are one of the most important incident/accident prevention tools in an organizational safety program. Using properly trained inspectors in a planned inspection program reduces incidents and property damage. An effective safety inspection program improves work men communication and their morale which in turn improves the organizational morale. Safety inspections are basic tool for establishing and maintaining safe conditions and discovering unsafe practices in the workplace. Systematic inspections are practical ways to identify and correct unsafe equipment, conditions, processes, and work practices. If unsafe conditions and practices are found to exist, prompt corrective actions are initiated. They are an excellent way to prevent accidents from occurring and to safeguard employees. An additional benefit occurring from safety inspections is that they give employees an opportunity to point out deficiencies in their area that may otherwise go unnoticed and uncorrected. Safety inspections are important since they allow the management to (i) listen to the concerns of workers and supervisors, (ii) gain further understanding of jobs and tasks, (iii) identify existing and potential hazards, (iv) determine underlying causes of hazards, (v) monitor hazard controls (personal protective equipment, engineering controls, policies, procedures), and (vi) recommend corrective actions. Safety inspections are conducted primarily not to find out how many things are wrong, but rather, to determine if things are satisfactory. Their secondary purpose is to discover conditions that, when corrected, will bring the facility up to accepted and approved standards and/or statutory requirements. During safety inspection, the inspection team examines who, what, where, when and how. It pays particular attention to items most likely to develop unsafe or unhealthy conditions because of stress, wear, impact, vibration, heat, corrosion, chemical reaction or misuse. Inspection must be carried out for the entire workplace area and must include areas where no work is done regularly. During the safety inspection, the inspection team looks at all work place elements such as the environment, the equipment and the process. The environment includes such hazards as noise, vibration, lighting, temperature, and ventilation. Equipment includes materials, tools, furnaces, and apparatus for producing a product or a service. The process involves how the work men interacts with the other elements in a series of tasks or operations. Types of work place hazards which are examined during safety inspection include (i) safety hazards such as inadequate machine guards, unsafe work place conditions and unsafe work practices, (ii) biological hazards caused by organisms such as viruses, bacteria, fungi and parasites, (iii) chemical hazards caused by a solid, liquid, vapour, gas, dust, fume or mist, (iv) ergonomic hazards caused by anatomical, physiological, and psychological demands on the work men, such as repetitive and forceful movements, vibration, temperature extremes, and awkward postures arising from improper work methods and improperly designed work stations, tools, and equipment, and (v) physical hazards caused by noise, vibration, energy, weather, heat, cold, electricity, radiation and pressure etc. A checklist is the basic tool for the safety inspection. It not only helps to control the inspection activities but also helps in the making of the inspection report. Checklists permit easy on the spot recording of the hazardous conditions. Besides regular work place safety inspections there are also the following three types of important safety inspections. Ongoing – This is the safety inspection which the work men carry out in their work area before the start of their daily work. Normally these inspections are part of their job responsibilities. with such inspections workmen identify hazardous conditions and either correct them immediately themselves or report them for corrective action. Daily inspection checks by users assure that the equipment meets minimum acceptable safety requirements. Pre-operation – Pre-operation checks involve inspections of new or modified equipment or processes. Often these are done after work place shutdowns. Periodic – Periodic inspections are regular, planned inspections of the critical components of equipment, process, or systems that have a high potential for causing serious injury or illness. The inspections are often part of preventive maintenance procedures or hazard control programs. These inspections are to be carried out by qualified persons periodically. In many cases such inspections are part of the regulatory requirement. Example of such inspection include inspection of elevators, boilers, pressure vessels, and fire extinguishers at regular intervals. Safety inspections are usually to be carried out by the inspection teams which normally include safety officer, departmental safety personnel, and a person who is well familiar of the equipment and process of the area. The inspection team also must involve the local work man of the area in the inspection. The members of the inspection team must have (i) knowledge of regulations and procedures, (ii) knowledge of potential hazards, and (iii) experience with work procedures involved. Large work places may have more than one inspection team. The various teams can have separate areas to inspect. Safety inspection teams bring a fresh view to an old familiar scene and usually catch details overlooked by people too close to the scene. Many unsafe and unhealthy conditions are transparent because they have always been a part of the scene. They are hardly noticeable. The consequence of safety inspections is that the inspected facilities become safe places to work. Very often, safety inspections are aimed primarily at finding and recording unsafe conditions. This narrow focus tends to ignore other causes of incidents, such as unsafe actions and personal factors. Inspection records are important. Past inspection records show what has been identified. They also show what an inspection team concentrated on and what areas it did not inspect. The inspection report can draw attention to possible hazards. However, safety inspection should not be simply a repeat or copy previous inspections. The earlier inspection report is to be used to determine whether previous recommendations were implemented. It is not possible to accurately estimate the time of inspection. The time required depends on what is found, how many questions are to be asked, and how large and complex the work area is. Inspections are ineffective when the given time allows for only a hasty look. The frequency of safety inspections depends on several factors which include (i) the frequency per the statutory requirement, (ii) past accident/incident records, (iii) number and size of different work operations, (iv) type of equipment and work processes (hazardous or potentially hazardous requires more regular inspection, (iv) number of shifts (the activity of every shift may vary), and (v) new processes or machinery. High hazard or high risk areas should receive extra attention. During inspections it is necessary to look for deviations from accepted work practices. The information derived from inspections must not be used for disciplinary measures. Some of the very common unsafe work practices generally seen during safety inspections include (i) use of machinery or tools without authority, (ii) violation of safe work practice, (iii) removing guards or other safety devices, or rendering them ineffective, (iv) using defective tools or equipment or using them in unsafe ways, (v) using hands or body instead of tools or push sticks, (vi) overloading, crowding, or failing to balance materials or handling materials in unsafe ways, including improper lifting, (vii) repairing or adjusting equipment which are in motion, under pressure, or electrically charged, (viii) failing to use or maintain, or improperly using, personal protective equipment or safety devices, (ix) creating unsafe, unsanitary, or unhealthy conditions by improper personal hygiene, by using compressed air for cleaning clothes, and by poor housekeeping etc., and (x) standing or working under suspended loads, scaffolds, shafts, or open hatches. When conducting inspections, follow The basic principles followed during safety inspections are (i) to draw attention to the presence of any immediate danger (other items can await the inspection report, (ii) to shut down any hazardous items that cannot be brought to a safe operating standard until repaired, (iii) not to operate any equipment. only the operator is to operate for a demonstration. If the operator of any piece of equipment does not know what dangers may be present, this is cause for concern, (iv) not to ignore any item even if the inspection team do not have knowledge to make an accurate judgment of safety, (v) There must not be a light approach. Each equipment, place is to be inspected in a methodical, through way and from all angles, (vi) details of the identified hazards need to be recorded in inspection notes on the spot, otherwise details get lost, (vii) in case the inspection is interrupted then the extent of inspection done is to be recorded, (viii) during inspection the work activities are not to be disrupted, (ix) to consider the static (stop position) and dynamic (in motion) conditions of the item being inspected, (x) discuss in a group to determine the hazards and the appropriate corrections or controls, (xi) do not rely on senses or gut feeling but on actual measurements, and (xii) to take a photograph in case of necessity. The inspection report is to make reference to previous inspection and action taken on the findings of previous inspection. It should include the observed unsafe condition and hazards as well as recommended methods of control. The report also is to include the department or area inspected, the date of inspection and the details of the inspection team. Each observed unsafe condition and hazard is to be assigned a priority level to indicate the urgency of the corrective action required.